Jim Murphy has opened up a commanding lead over Douglas Alexander at the top of the league. Following a month in which he landed yet another urgent question and was a fixture in the media, there is now a gap of 74 points between first and second. The gap is all the bigger because of an uncharacteristically quiet month for Alexander. For the first time since the shadow cabinet was formed, he didn’t put out a single press release in the month. Based on his performance in May, Alexander was the eighth hardest working member of the shadow cabinet. He has never been this low in a monthly ranking. It’s too early to tell whether this is the start of a decline in his work rate, but with the conflict in Libya, upheaval in the Middle East and the Taliban’s summer offensive underway, this is hardly time for a dip in activity. In third, Sadiq Khan posted another solid month. He stepped up his media output, issuing four press releases, double the number of any previous month. In previous months, this media profile has been a weakness for Khan. Increased press work will help establish him as a major Labour figure in his own right, beyond having been Ed Miliband’s leadership campaign manager. But, for Khan, there were areas for improvement that highlighted the difference between being third and what it takes to be number one. With super-injunctions all over the media and Parliament in tumult, this should have been the opportunity for an urgent question from Labour’s shadow justice secretary. As an opposition, it is hard for Labour to cut through on these types of issues and an urgent question could have given Labour a clear role in the debate, taking the government to task for its baffled silence on a legal farce. But John Whittingdale, Tory chair of the culture select committee, beat him to the punch and Labour remained sidelined. Khan spoke in the debate, but it wasn’t reported widely and the government weren’t held to account for what Khan correctly identified as their confused and muddled approach. New in at fourth is Maria Eagle, who jumped four places, overtaking the likes of Ed Balls, Yvette Cooper and her own sister, Angela, who drops to fifth. The sight of the Eagle sisters in the top five is testament to a shared work ethic. While Maria tends to put down more questions, and Angela issues more media releases, the common thread between their performances is consistent, applied work rate. Maria’s rise this month was based on a barrage of written questions looking at that old Parliamentary favourite of oppositions, how much Ministers spent on taxi fares. 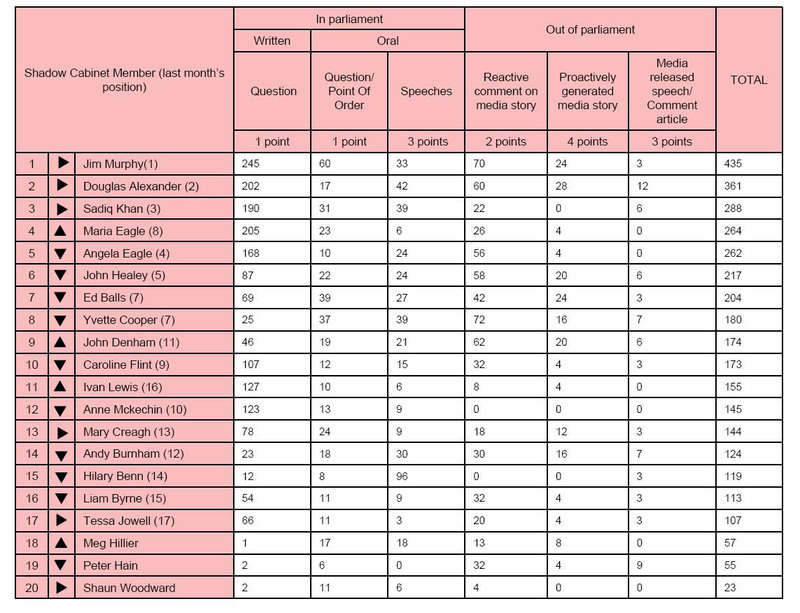 There are sure-fire stories in those figures and one of the tests for Maria Eagle in the coming weeks will be how much press coverage she can generate from the answers to her PQs. In the middle of the table, there were some big moves and personal bests in terms of monthly work rate. John Denham posted his biggest month to date, piling up more than three times as many points as any previous month. He nailed David Willets with an urgent question, winning Uncut readers’ shadow cabinet goal of the month for his despatch box delivery. Denham also re-discovered the value of asking written PQs and combined with his consistent media work rate gave the all round performance of a shadow cabinet heavyweight. Ivan Lewis, whose performance this year had been almost comatose, suddenly came to life. As with John Denham, he re-discovered the table office in the House of Commons, where questions are put down, and became a regular visitor. In May alone, he put down almost as many written PQs as in the preceding seven months combined, and leapt five places as a result. Mary Creagh, a conspicuous under-performer in her first few weeks in post, is clearly getting to grips with being a shadow secretary of state. She capped months of steady improvement with an urgent question on whether the government was going to ban animals from circuses. It prompted a response from ministers that was ludicrous even by their standards, as they tried to explain that animals couldn’t be banned from because of the European convention on human rights. Although Creagh’s points score didn’t translate into a move up the rankings, it was indicative of her new more assured approach that has seen her climb out of the lower reaches of the table since January. If Denham, Lewis and Creagh continue at this rate, they will soon be knocking on the door of the top five, pushing the leaders to up their game. Unfortunately, this sort of improvement seems unlikely at the foot of the table. The bottom three remained the same as last month, and the month before that – Hillier, Hain and Woodward. The gulf that has opened up with the rest of the table does not look likely to be bridged any time soon. Although Meg Hillier climbed one place, swapping positions with Peter Hain, this was more down to his inactivity. In May, he didn’t put out a single press release as shadow secretary of state for Wales, or ask a PQ, or even make a speech that was released to the media. In contrast, Meg Hillier had to respond to a series of Departmental announcements, boosting her score through appearances at the despatch box. These Parliamentary announcements from the department of energy and climate change offered Hillier a rare opportunity. Despite months of abject inactivity, she had the chance for redemption when facing Chris Huhne. Huhne’s troubles have got to the point where it has become passé to use him as the punchline of a joke. When someone so little liked in Parliament is so wounded, the Commons chamber can be a merciless bear-pit. A bravura performance from Hillier could have wiped away months of indifference in a single devastating assault. But instead of blitzkrieg attack she gave a pallid performance. Following Huhne’s statement on the fourth Carbon budget, the sketch writers might have delighted the various driving related jokes made by almost all members who spoke, but the footage from the debate tells the story of a non-event. Huhne couldn’t believe his luck. As the Tory-led government has completed its first year, the shadow cabinet remains a work in progress. The work ethic so evident at the top of the table is spreading to the middle but remains stubbornly alien at the bottom of the league. When the shadow cabinet was formed there was a clear view that a cycle of annual elections was destabilising. There’s a lot to that. But there is a danger that under the current rules, a job at Labour’s top table is now a two year sinecure. The question is whether there is a middle ground where there is some accountability for performance while maintaining stability. For those that consistently under-perform, should there be some kind of sanction? And for those shadow ministers of state that are working hard, showing how it’s done, will there be any progression before October 2012? As ever at Uncut, we’re interested in what you think. So we’ve given you a choice. The two options aren’t intended to be definitive but give an indication of where the Uncut public are on this. This entry was posted on Friday, May 27th, 2011 at 7:39 am	and is filed under Uncut. You can follow any responses to this entry through the RSS 2.0 feed.You can skip to the end and leave a response. Pinging is currently not allowed. Clearly Douglas Alexander has been asleep on the job. What happened to all that talk about holding the government to account on Libya? We see action after action which shows that mission creep is evident. In general the LP’s approach to Libya has been woeful. Long after Gadaffi has been removed which has after all been the intention all along, Libya will be plagued by endemic civil war as was the case in Lebanon, which lasted for twenty five years!! Regime change is illegal under international law and yet there seems to be silence on the opposition back benches. Does this mean that had the LP been in government, the same approach would have been taken? I for one am deeply dismayed by the one sided coverage of the Libya conflict and do not believe that we the general public are being told the whole truth. The LP must bear some responsibility for this by failing to hold the government to account. As for this Military action being sanctioned by the UN Security Council, how is it that Russia, China, Brazil, India, South Africa, Turkey and the Arab League have all come out and said that the military actions undertaken in Libya go far beyond the mandate of the 1973 resolution. Who can now hold the coalition to account over this escalating military conflict? You say that Douglas Alexander is holding the goverenment to account on mission creep in Libya, and yet the facts speak otherwise. Mission creep continues on a daily basis, despite the offerings of Alexander. SO tell me please what effect his interventions have had on the government. Or is it the case that the Labour party is completely supportive of the current government? I do not sense either any great outrage on the part of the Labour Party generally.